7 Days/6 Nights From $1,349 per person. 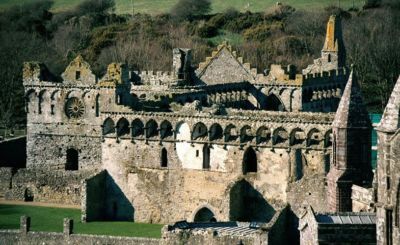 Visit romantic castles, Celtic artifacts, Roman forts, and ancient heritage, all of which have all been lovingly preserved to bring the vibrant past of Wales to life. Delight in the myths and legends of Merlin and King Arthur. Breath in the beauty of the magnificent mountains and spectacular coastline. Wales is often called the “Land of Castles,” and rightly so – come see if for yourself! 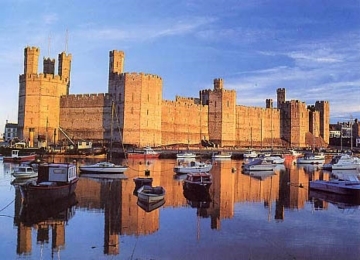 Arrive at Manchester Airport, pick up your rental car and drive to Conwy in beautiful North Wales. Pass through the City of Chester, with its Roman remains, ancient cathedral and many old buildings. Spend 3-nights at lovely old Bodysgallen Hall. This morning explore Conwy, with its great 13th century castle and town walls (built by King Edward 1st), old medieval houses like Plas Mawr and Aberconwy, the harbour, and the “Smallest House in Britain!” In the afternoon visit Llandudno, North Wales’s major Victorian seaside resort. 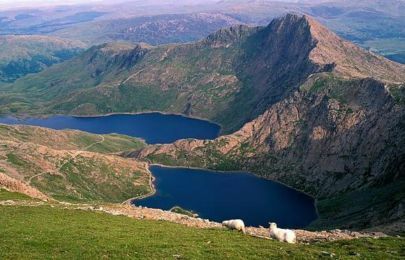 Take a full day to drive around North Wales and the Snowdonia National Park. Drive to Bangor over the dramatic Llanberis Pass (take the Snowdon Mountain Railway if its a clear day !). Cross the Menai Suspension Bridge on to the Isle of Anglesey to visit a great Edwardian castle at Beaumaris. Continue to the castle at Caernarfon, scene of the investiture of Prince Charles as Prince of Wales. Return via Porthmadog and Beddgelert. This morning, head south through Snowdonia and Brecon Beacons National Park to Pembrokeshire. Enjoy 3-nights at the Court Hotel in Lamphey village. Today visit Carew, a very beautiful castle on a river-side location. Be sure to include the old tidal mill a mile upstream. 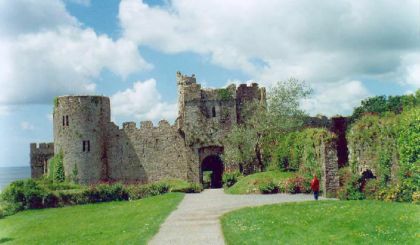 Continue to the great castle at Manorbier, with a courtyard and many explorable towers. Sample some of the fine beaches along the dramatic coast, such as Marloes Sands, before returning to Pembroke. Explore more Pembrokeshire treasures, including St. David’s, one of Britain’s smallest cities with a cathedral and a fascinating ruined Bishop’s Palace and the fishing village of Solva, at the head of a fjord-like inlet. This evening you might want to enjoy a night of Welsh Culture with singing, dancing, storytelling and typical Welsh dishes at the Celtic Corner. Say farewell to Wales today, drive to Manchester Airport, return your rental car and board your flight for home! 6-Nights Accommodation in luxurious Country Mansions. 6 Days Self-Drive rental car including unlimited mileage, taxes and insurance. Services of our offices in the United Kingdom while travelling. Travel Documents including Personalized Itinerary. From $1,349 per person. Call 1-800-832-1848 for more details.